You can access our website home page and browse our site without disclosing your personal data. There may be pages on the site that invite visitors to send information via forms or e-mail to enable you to ask for publications or information and advice, or to tell us what you think about particular issues. Kidmore End Parish Council takes great care of any personal information you give us in this way and in the following paragraphs we set out how any personal information you give us is treated. If you choose to give us information about yourself you will be consenting to the collection, processing and storage of the information you provide. Before collecting any personal details through its web sites, Kidmore End Parish Council will tell you why we need the information and what it will be used for. You always have the option of declining to give us personal information or data. Kidmore End Parish Council ensures that only parish council members that have a business reason to look at your information or data can do so. Kidmore End Parish Council will never sell personal information or data or share personal information or data with third parties unrelated to the services we provide unless we are required to do so by law or unless you have told us you consent to our doing this. Information you provide will be stored by Kidmore End Parish Council and used to process the request; it will be retained for a reasonable period. Kidmore End Parish Council has no way of knowing if any person providing information through this site is who they say they are. Kidmore End Parish Council will assume all information is genuine and cannot be held responsible for any action taken as a result on relying it. You have the right to request us to remove personal data from our website at any time. To do so, please contact us. Should you have any concern regarding collection, processing, storage or disclosure of information submitted via this website please contact Kidmore End Parish Council. You have the right to ask for a copy of the personal information or data Kidmore End Parish Council holds about you. The website may include bulletin boards, discussion groups and other public areas that allow feedback to Kidmore End Parish Council and interaction between users. Kidmore End Parish Council does not control the information posted to these areas but it does expect contributors to comply with the following rules and also to any additional rules that may be introduced for a particular forum (the need to register for instance) . Kidmore End Parish Council may delete, move or edit any messages it deems unsuitable without giving a reason. You are solely responsible for the content of your messages and agree to indemnify Kidmore End Parish Council l for any loss that we may suffer because of your action. For the purposes of sending out electronic communications, Kidmore End Parish Council uses a third party software service, Mailchimp, which automatically collects and stores the information you provide (name and email address) in a safe server. All its protocols are compliant with current UK and EU legislation and you can find out more about it on their website. Kidmore End Parish Council hereby informs Users of the possible placing of cookies while browsing on their computers, due to which, when browsing the website, the IP address of the User’s computer, among other possible browsing details, can be automatically recognized. Cookies shall be used solely for the purpose of maintaining the browsing session, as a form of User identification, or for statistical purposes for the exclusive use of Kidmore End Parish Council, such as, for example, identification of the frequency of visits to the website, which sections and contents are most often visited by the User, etc. If Users do not wish to accept the generation of cookies on their computers, they should remove this possibility by marking the corresponding option in the configuration area of their web browsers. Notwithstanding the foregoing, Kidmore End Parish Council is not responsible for any irregularities that the non-acceptance of cookies may generate while browsing the website. Kidmore End Parish Council Council owns the copyright and all other intellectual property rights associated with the content of this website except where otherwise stated. You are welcome to print individual pages or store them in electronic form on a PC for your own personal use. You may not reproduce, modify, or use for financial gain any material on this site without first getting permission from the copyright holders or owners concerned. While every care has been taken to ensure the accuracy of information on this site Kidmore End Parish Council Council accepts no responsibility for any errors, omissions, or misleading statements on these pages. 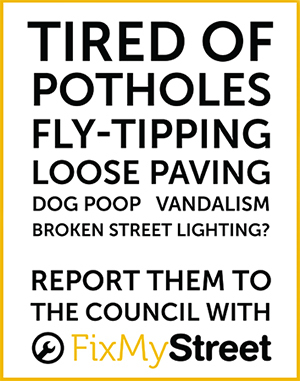 In line with this Kidmore End Parish Council Council is not liable for any action you may take as a result of relying on such information or advice or for any loss or damage suffered by you as a result of taking this action. Kidmore End Parish Council Council ‘sWeb site may include links to other websites to help you find other relevant information quickly and easily. Kidmore End Parish Council Council does not endorse or approve the contents of any third party Web sites to which these pages are linked and does not accept any liability for action you may take as a result of relying on information or advice obtained from such sites. Kidmore End Parish Council reserves the right to modify, without prior notice and at any time, the content of all or some of the aspects contained in this Legal Notice in order to adapt it to current regulations that may be applicable at any given time or to the operation or addition of new services. In the event of such a modification, Kidmore End Parish Council undertakes to conveniently publish the modified or updated Legal Notice on the website so that it is available to Users, as well as to any other interested person. Under all circumstances, the Legal Notice published at the time in which the website is effectively accessed, and/or the services therein are effectively used, shall apply.